The new COSEE exhibit had its debut at the 2008 annual meeting of the Society for the Advancement of Chicanos and Native Americans in Science (SACNAS). The annual SACNAS meeting brings together scientists, graduate students, undergraduate students, teachers, and high school students in a highly interactive environment. One of SACNAS' main goals is to mentor students through the science education pipeline into graduate degree programs. The meeting also provides a concentrated opportunity for universities to recruit undergraduates, graduate students, and post-docs from diverse and underrepresented communities. The COSEE exhibit was well received by the over 2500 participants. The conference had specific times for students to meet with the exhibitors over two days. 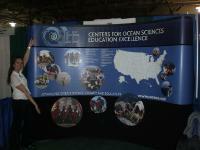 Many undergraduates stopped to speak with us about careers in ocean science research. Most of them wanted information on summer research/internship opportunities and on graduate programs. There is a large need to support undergraduates in finding their way to ocean science graduate programs. COSEE is investigating ways to better engage undergraduates and graduate students, especially those underrepresented in ocean sciences.